That's not an error in the aspect ratio of the picture, it is now 165mm x 140mm. Distinctly oval. I've planed the base back flat so it does not wobble, but I'm still deciding what to do with it. Perhaps it's shape could be regarded as character. It is a shame that lovely pinkish terracotta colour of the fresh wood has faded to a less exciting brown. Perhaps a food safe oil finish might restore it a bit. Or I always need kindling. Ha! Maybe try some pear juice on it, CH. I know to my cost that if you allow pear juice to drip on your best white top and don't clean it off immediately, it dries to a pinkish brown stain that NEVER comes out. Nothing wrong with an oval bowl so long as it doesn't continue to change shape. How long after turning did it do it? It sat around for about three weeks looking fairly round, then quite rapidly shrank and distorted. 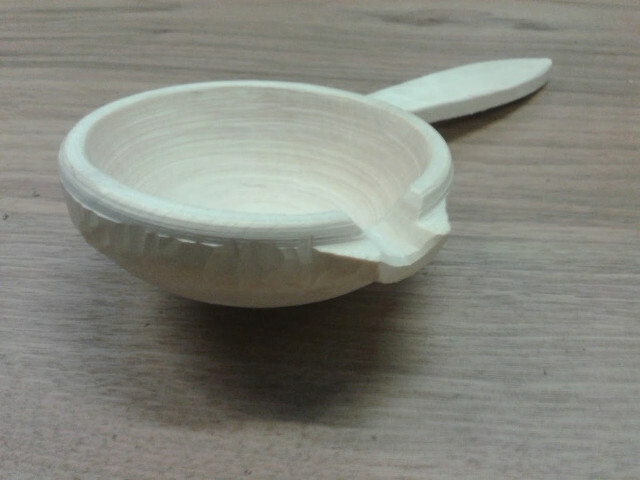 My friend Jim who I gave a piece of the same wood to also made a bowl, with exactly the same result. Jim has, for the past year, been working on improving his bowl turning. He set himself the target of making one a week for a year - in fact he made rather more than that. The pear wood bowl was the one that distorted the most ! I have oiled it with walnut oil, and it has regained a bit of the interesting colour. Not sure what to do with it yet, it can sit on the shelf for a bit while I think of a use for it. The weekend just gone was Wimpole's produce fair. I like this event, though the stalls were a bit fewer than ideal, there were some good local food businesses there to visit - bread, hot sauces, jam, fudge etc. There was also a Cretan produce stall - the company is local, though the produce comes from his family farm on Crete. He also did a tasty spinach pie for lunch ! Was a devil to turn. The starting point is a ~5" log of sycamore, split in not quite half, then the larger piece roughed into shape with axe and saw. 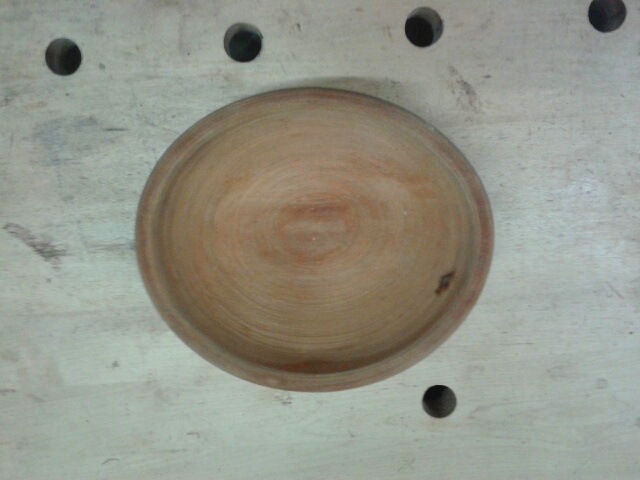 The put on a mandrel, and the outside of the bowl and rim turned, reversed, and the inside of the bowl hollowed out. Trouble is all the time that bit that forms the handle is wanging around off centre, and getting in the way. Very creative positioning of the tool rest needed to avoid collision, and a lot of care over where you leave your fingers ! Finally, there is a ring around the outside where the handle and the spout are joined that can't be turned; the excess here is trimmed away with axe and knife. I could have smoothed it out more, but I thought I quite liked the faceted band as a decoration. Crikey, a lot of dust has settled here. I cleared some space to start over on chair #4 yesterday. A lath back chair, in a more greenwood/craft sort of style than the last one. This will be chair 3 of our not-quite-a-set of dining chairs, the idea being that they are all handmade from green ash and woven seagrass, but each in a slighly different style, but with common elements to the turnery. This one if for Mrs C-H, who likes some lumbar support, which the steam bent back laths can provide. So far I've planed up some ash to 8mm think boards to be bent into the laths. Also acquired a 1m long ash log to make the back legs last weekend, spare from the log to leg races at the bodger's ball. It is of course last weekend's visit to the Bodgers' ball that has got the enthusiasm back. A rather diminished turn out from the Wimpole gang, but a bigger event overall despite that. I took along my Smoker's bow and entered it into the craft competition armchair category - but no prize for me this time, the competition was quite strong, first prize going to a colonial American style chair that was very well made. I saw a good few things I'd like to try - a hexagonal stool, plates, and a mug with a handle turned in one piece - very tricky ! I managed to miss your post of 8 months ago. 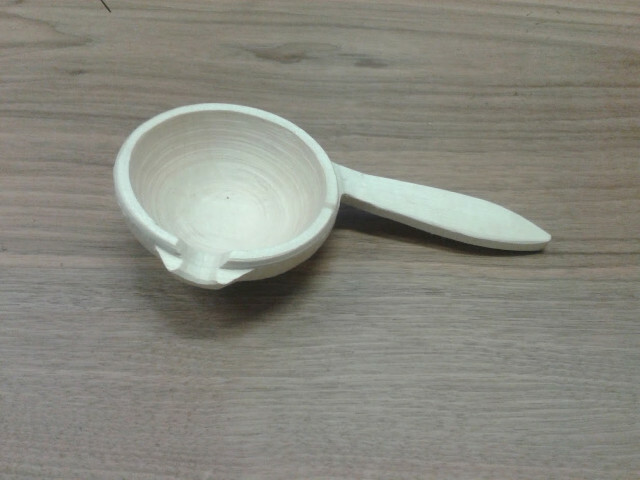 I love your Roman spoon thing and can see that it must have been very challenging to turn. Finally got my axe out and got back to chairmaking yesterday. I got 4 spindles turned, and another four roughed out ready for the lathe. Funny wood. It is ash, but you can tell the difference between Shropshire ash and Wimpole ash ! Harder to split and turn, it seem somehow more "fibrous" ? It would probably make great axe handles. This has kept me busy for the last 10 days or so. A lot of hours of work, though it doesn't look like it. It's rare for me to get a calligraphy commission these days, but I have inscribed the names on the previous board for the last 18 years. I was hoping that if they had a new one (they nearly decided not) the work would come my way. Oh! Why does it do that? It's the right way up in my photos. What a lovely piece of work, Freebird. And pleasing to hear that someone values real artwork. I like the way the light catches the gilding in the twirly bits. Gosh, that's beautiful. 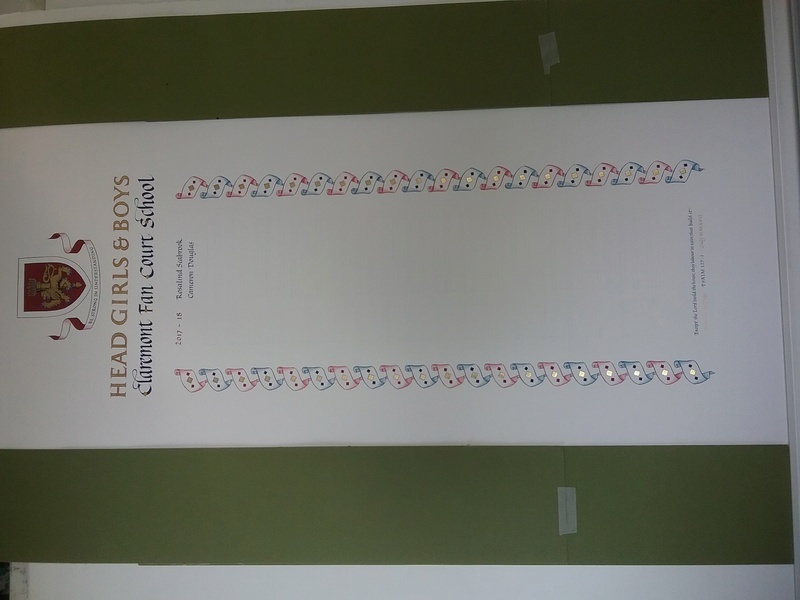 I presume it comes bank to you each year to add names. Managed to find time to sneak in the workshop today. Brrrr it was cold. Only one thing for it - steam bending to make some warmth ! I made the set of 4 back laths for a chair for Mrs C-H. She likes some lumbar support, hence the choice of design. I've made the bending jig to measure, so it should be a very comfy fitting chair - for her at least ! Not many people get a made to measure dining chair I imagine. Not many people get a made to measure dining chair I imagine. My refresh of the bathroom decor is almost done, just need the new bath panel. For which I need some steamed beech. In the meantime, in anticipation of lots of cutting up wood, I've been sharpening and setting some old saws. You can get a surprisingly good saw for a tenner from EBay or a junk sale, if you can master the craft of saw sharpening. Not many people do this these days with the dominance of throw away hardpoint saws. Done four, three off EBay and one left to me by my grandad , which makes it special. I put those saws into action today. Several hours of sawing and planing, and I have all the stock dimensioned ready to start cutting joints to make the bath panels. It's good exercise preparing rough sawn wood all by hand. One of the new to me, and freshly sharpened saws is a huge rip saw. 3 1/2 teeth per inch, it cuts so quickly. Very pleased with it. It is good to get some planing practice too; getting four sides straight, smooth and perpendicular does need practice, and is particularly tricky when the bits of wood are longer than my bench ! Gosh. Those bath panels are finished, but still sitting in my workshop waiting to be fitted. Current job is repairing deckchairs. Fabric worn out, I almost succumbed to buying new ones of e**y, but spotted the negative reviews in time, pointing out that they were undersized, flimsy and made of cheap materials. So, repair the old ones again ... these I originally pulled from a skip, they had a painted indication that they came from the local cricket club. That was about 20 years ago. This is now the third re-conditioning ! I'm hoping I have enough beech left over from my various jobs to make an extra one - they aren't a complicated bit of woodwork ! Bath panels are on, and look very smart, for how long I wonder. Woodwork in a bathroom is a bit of a risk. I don't like the wobbly plastic panels though. I suppose the last set lasted 15 years, which is not too bad. Now to refurbish the bathroom cabinet I also made 15 years ago !